The drink considered to be the healthiest is water. We beg to differ. Tea, properly made, is like super water. Along with the nourishing benefits of water, tea contains many compounds that are excellent for health. It also tastes really good, which is the biggest complaint about water! There are so many varieties of tea that it can be hard to choose between them. 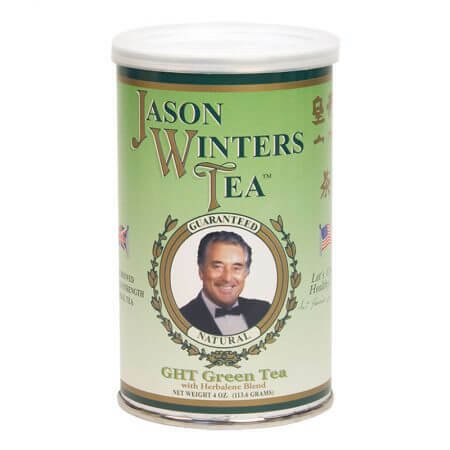 Green tea is considered the healthiest variety of tea which is why we prefer it here at Jason Winters International. Let’s look at what separates green tea from the rest of the tea varieties, why steeping temperature is so important for green tea, and how the addition of our herbal blend can make an already-healthy drink into something more. The plant that people use to create tea is a small bush called Camilla sinensis. From this single plant come all the different cultivars of tea. Leaves from this plant are processed in many different ways to form the final product that we sip every morning. This variation is what gives tea its great complexity of flavor. Most people select tea based on its variety rather than where it is grown, though connoisseurs of tea may track down teas from particular regions just like coffee drinkers do. What separates most tea varieties is the processing done to the leaves after picking. The primary process that separates tea varieties is oxidation. The common black teas that you can get in any grocery store are fully oxidized. This is what creates the dark color, distinct flavor, and higher caffeine content of black tea compared to green tea. Green tea, on the other hand, isn’t oxidized much at all. The leaves are cooked briefly to stop the oxidation process before they are dried. This not only retains the color but also many of the phytonutrients which are the keys to green tea’s health. What Makes Green Tea Healthy? Green teas contain a high amount of antioxidant compounds called polyphenols. These polyphenols have been studied by scientists for their health benefits. It helps with a wide range of conditions like diabetes, obesity, and other modern ills. This literature review from 2010 goes into great detail about the wonderful benefits of drinking tea regularly. It’s no wonder humans have used it for thousands of years! Only in a few countries, notably Myanmar, do people eat tea leaves directly for health and these are fermented in advance. The rest of the country brews tea in water. Drinkers have learned that the temperature of the water is a crucial factor in the final flavor of the tea. But the right temperature can vary widely depending on taste and opinion. However, green teas usually shouldn’t be exposed to full boiling water. 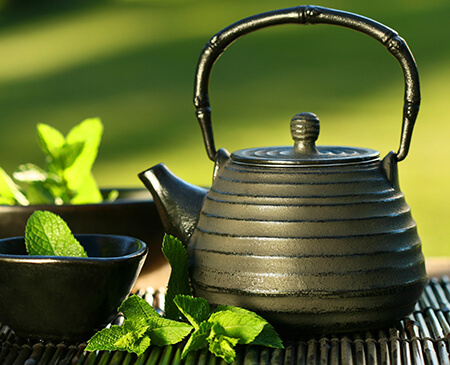 A temperature of anywhere from 160 to 180 degrees Fahrenheit is best to avoid strong grassy and bitter flavors from green teas. It is better to judge on the lower side of temperature than a higher one. We invite you to experiment with different water temps. Also, it’s best to bring water up to temperature rather than boiling it and letting it cool. Boiling water removes the oxygen from the water and makes it taste flat. 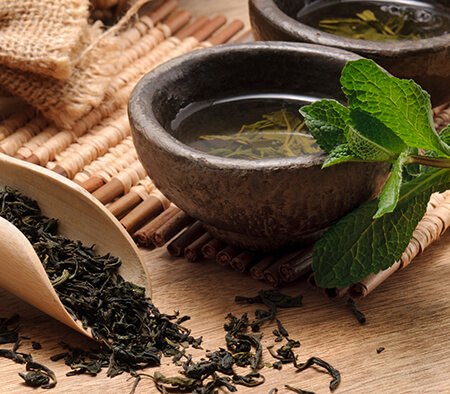 As an alternative, you can also brew green tea cold by letting it sit in a pitcher of water for several hours. This will result in a much less bitter drink and the health qualities are still the same. Heating the water just extracts the antioxidants and flavor much faster. What’s important for brewing, in the end, is what makes green tea taste good enough that you’ll continue to drink it! There are special tea kettles on the market that will warm up water to a preset temperature so you can experiment. In common parlance, any herb that is soaked in hot water to extract its benefits is a tea. Teas that aren’t made with Camilla sinensis are called herbal teas to avoid confusion. There are many kinds of herbal teas out there, each with their own benefits and flavors for you to explore. Sir Jason Winters Tea, however, is something truly special. The combination of red clover, sage/chaparral, and Herbalene has been reported by our customers to improve the quality of their life in many ways. You can read many of their testimonials here on this site, especially in the reviews of our products. Some people prefer to have the taste of tea leaves along with their herbs. That’s why we sell our Original and Classic blends with green tea for those who prefer its taste. However, most herbal teas require a full boil to extract all of their benefits. That’s why we created a proprietary process to coat the leaves of our green tea with the extracted compounds of the three herbs in Sir Jason Winters Formula. This way, you can brew it at the proper temperature for green tea without losing the effectiveness of the original ingredients. Plus, we also sell the green tea base that we use as a separate product if you want an excellent Asian green tea for your own enjoyment and health. Green tea, when properly made, is one of the best drinks you can choose for yourself. It’s low in caffeine, high in phytonutrients, and tastes a lot better than water. Give it a try instead of a morning cup of coffee. After a while, we bet you’ll prefer the taste of green tea and the way that it makes you feel.